Like any art form, film draws from the political and social climate of its time in order to criticize and comment on issues that we deal with in day-to-day life, however what happens when the tables turn causing the political world to criticize the filmmaking world? Unfortunately those working in Hollywood during the 40’s and 50’s can answer this question all to well. After World War II, the Soviet Union became the United States greatest fear. Campaigns around the country warned the citizens of the U.S. that even their closest friends might very well be communists operating with the singular goal of brining down the country. It was not before long that the red scare swept over the country and politicians begin turning to the film and television industry in their inquisition causing the creation of the blacklist. It wouldn’t be until decades later in the film, The Front (1976), where the blacklisted victim’s careers would recover enough to the point where they could use their first hand accounts of the situation to share their story. The bone chilling lifestyle that the blacklisted had to endure is accurately captured in the film, leaving the audience in a state of anger and disbelief as they realize society allowed this event to occur. As described through the film, in order to fully understand the impact of the blacklist, one must also understand how it came to be and why studios were so accepting of it. As previously mentioned, after World War II society gained a sense of fear against the Soviet Union and communism, this fear resulted in the paranoia that communists were infiltrating various industries in the United States. Eventually, this paranoia resulted in the House Un-American Activities Committee investing Hollywood to see if communistic ideals were being spread in film and television. During this investigation the committee held hearings where various leaders within Hollywood such as Walt Disney and Ronald Reagan admitted that there were communists operating in Hollywood and even listed some of these individuals names. Once someone’s name was linked to being a communist, it was nearly impossible for them to clear the name without denying all involvement with the communist party and naming others in Hollywood that were communist. This process then turned into a witch-hunt according to Walter Bernstein, writer of The Front, who said in his book Inside Out: A memoir of The Blacklist, “Yet in the witch-hunting hysteria of the Cold War, when screenwriters were accused of ‘premature anti-fascism,’ anything mildly left or even not right of center was denounced as subversive, and those so accused were imprisoned and/or driven underground.” The issue of whether or not those that were named in the hearings should be allowed to work in Hollywood became a hotbed issue in society causing interest groups within the country to boycott any studio that employed suspected communists. Fearful at the thought of losing money, studios created a blacklist of suspected communists that under no exception should not be hired by the studio since they would cause protests. Instantly many individuals were locked out of Hollywood overnight terminating the careers that they had spent their whole life building. At first the largest effect of the blacklist was the shrinking of the pool of voices and ideologies that were presented through film and television. This resulted in an overall degradation in quality of entertainment during this period as the amount of people responsible for making films decreased along with the courage of the filmmakers not part of the blacklist to do anything controversial. However, after the initial implication of the blacklist started to wear off, studios were in the market for fresh ideas for films and television. This thirst for new material meant that they were willing to accept ideas from unknown individuals. Although, unbeknown to the studios these unknown writers were often factious or fronts for the blacklisted writers who were struggling to make money and were willing to sell their work for cheaper under a different name. Ironically, these fronts begun gaining fame themselves and winning various awards such as Ian McLellan Hunter for Roman Holiday which one an academy award for best story and was really written by blacklisted screenwriter Dalton Trumbo. This narrative supplies the premise for Martin Ritt’s film, The Front which provides an in depth look at the life of one of the fronts for the blacklisted screenwriters. More importantly, the film was made by several blacklisted filmmakers allowing for their personal stories to be expressed, which in a world void of the elaborate media coverage of today’s world not touched upon until the film’s release. In The front, the main character, Howard Prince (Woody Allen,) starts to sell television episode scripts under his name for his friend Alfred Miller (Michael Murphy) because Miller was blacklisted. Throughout the course of the film, a slew of comedic events occurs as Howard struggles with selling scripts while hiding the fact that we does not actually have any talent. The subplots to the film involve Howard starting a romantic relationship with a script editor who thinks Howard has artistic merit. 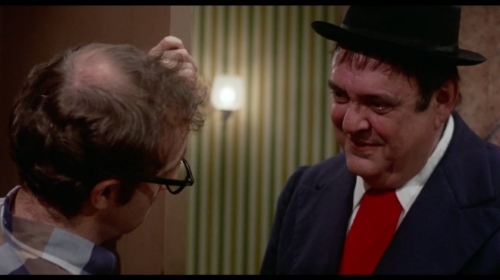 In addition, Hecky Brown (Zero Mostel), the lead actor in the show Howard sells scripts to throughout the course of the film starts to lose hold on his life as he is placed on the blacklist ultimately leading to his suicide. Upon initial inspection of the film, one would write it off as just another Woody Allen-esque comedy where an inadequate man fumbles through life for the audience’s assessment. Yet, it is this assumption of the film that ultimately allows for the audience to grasp the gravity that the blacklist had on individuals in Hollywood. The audience is first introduced to the lifestyle of a blacklisted writer very early on in the film with Howard’s friend Alfred. Since by the time the audience is introduced to Alfred he is blacklisted and struggling to make money, they do not really get the opportunity to see just how drastically the blacklist has affected him. But what the audience is able to see in the initial meeting Howard has with Alfred is just how desperate he is. Not only is Alfred willing to let his work be accredited to someone else, but also he is willing to do so for a percentage of what his work would normally earn him. Admittedly, this small tidbit of information is not drastically responsible for impacting the viewer but it does lay the framework for the audience to fully understand how screenwriters during this period were exploited. This occurs later on in the film once word amongst blacklisted writers gets out that Howard is successfully selling Alfred’s scripts causing them to ask Howard if he could also sell their scripts. As a result, Howard starts to make a ridiculous amount of money for very little work, allowing him to start exploring different social circles and date others in the industry such as script editor Florence Barrett (Andrea Marcovicci). It is at this point that the audience starts to realize just how much money the blacklisted screenwriters are losing that Howard is pocketing. In addition to fully understanding the amount of money the writers are losing the audience also becomes aware as to how large the blacklist is as Howard struggles to keep track of all of the scripts he is supposed to be responsible for. The only issue with these portrayals of life on the blacklist is that they are shown comically at times and do not highlight the seriousness of the list. Yet, the veil of comedy crashes down towards the latter half of the film during the Hecky Brown character subplot. Throughout the first half of the film, Hecky Brown is a successful television show actor that audiences love because of his on screen humor. As the film’s plot progresses, Hecky starts to become linked to communism by the government and as a result the show producers fire him. From this point forward, Hecky’s life spirals out of control as everything around him starts to crumble because his friends in the industry are afraid to associate with him and his source of income disappears. Later on, Hecky seems like he may catch a break when a hotel owner offers to pay him $500 for a performance, however knowing that Hecky is in no position to argue, he gives him less than they agreed upon. This sends Hecky into a tailspin as he desperately not only needs the money, but also is embarrassed by his new stature in the entertainment community. Since the rest of the film is so much lighter hearted and comedic, when Hecky takes his life by jumping out of a window, the audience is shell-shocked as the gravity of what they have been watching hits them and they understand the devastation caused by the blacklist. While art is supposed to be an activity that unites society, the fears of society were too much for to fight off in the 40 and 50’s, resulting in the darkest period in Hollywood history. While it is uncomprehend able to think about the films and televisions shows audiences around the world were robbed off because of the blacklist, it is tragic to think of the lifestyle’s and individuals that the blacklist claimed. With the lack of minority voices present in Hollywood film and television today, it makes one wonder what future generations will say about the current Hollywood system and the list that is used to determine who is allowed to participate. Thank you for visiting Celluloid Cinema, please leave your thoughts below.